SANTA CLARA, Calif. (KGO) -- As of 7 p.m. Sunday 16,844 people are without power in the Bay Area due to amassive storm massive storm. Click here for a full map of which areas are impacted. 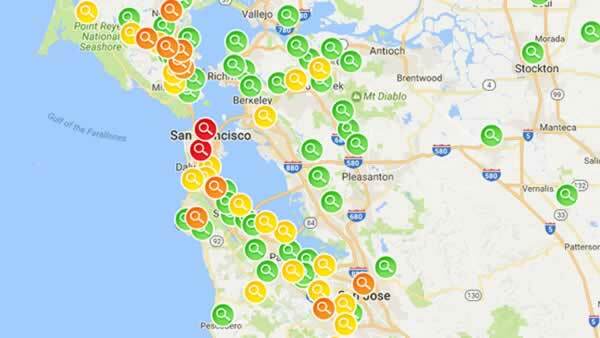 An estimated 5,626 are out of power in the Peninsula, 5,326 in the North Bay and 2,509 in San Francisco. PG&E reported over 33,000 people were without power Sunday as the storm ripped through the Bay Area. If your car gets hit by a power pole, you are advised to stay away from the ground near your vehicle. If you are inside the vehicle, stay inside and keep people away since the area could be charged. PG&E has a resource page here that has tips on how to stay safe during power outages. PG&E is asking that you report safety concerns to 1(800) 743-5000. If you see a downed line call 911 immediately.